If mankind's affairs are tinkered with from Outside, it must be with malicious intent. If a man walks across a ten-acre tract in the dark, with one rock on it, he'll invariably bust his toe on that rock. If there is one weak spot in the ice on a frozen river five hundred miles long, he'll find it and fall through. If he is confronted with seventeen roads, one of which leads into a cactus-bed and the other sixteen to his destination, he will inevitably select the one wrong road. 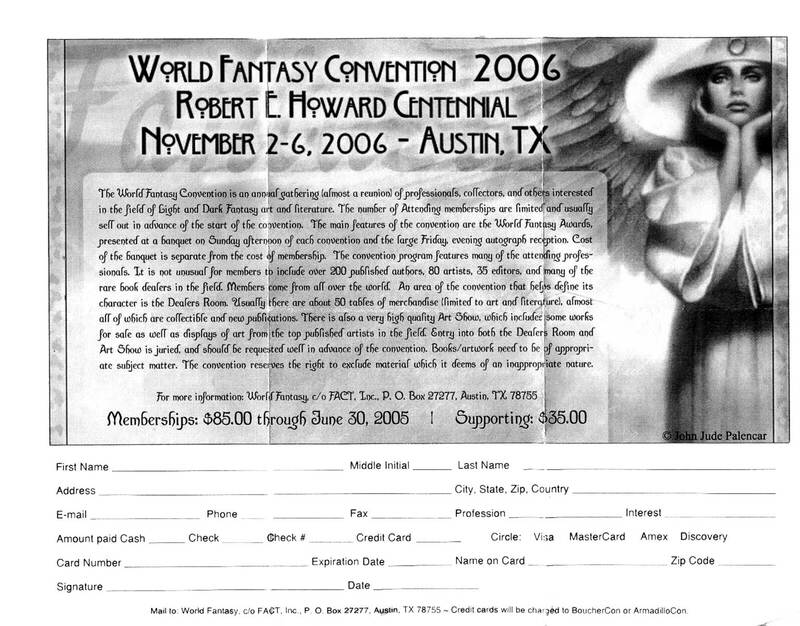 In case you haven’t heard, the World Fantasy Convention for 2006 is going to be held in Austin, Texas, and the theme of the Con will be the Centennial of Robert E. Howard’s birth. Attendance is limited, and you have to purchase a “membership.” Click on the pic to view the flyer that was passed out by the Siros brothers (i.e. the 2006 WorldCon folks) at this year’s Howard Days. Incidentally, the Con guys were saying that Howard fans are welcome to “pack the field” of the World Fantasy Awards with nominees from Howard fandom. So The Cimmerian could be nominated for the Non-Pro Category, Wandering Star editors and artists could be nominated for their respective categories, etc. Keep that in mind when purchasing your membership, nominating, and voting. Together we can make the Con Howard-centric in more ways than one.